Everyone wearing glasses or contacts knows the importance of having the correct lens prescription. Vision is vital to our activities of daily life whether it’s driving, reading, or using a computer at work. You might believe that optometrists only help you with your eyesight prescription, but there is actually much more to the services they provide. While online eye exams look like a cost-effective option, you should know what it lacks. Taking good care of your eye health requires a comprehensive eye examination conducted by your optometrist. The money spent on the online tests might sound appealing, but it does not compare to an in-person visit to your optometrist. An online eye exam rudimentarily measures sight, and then a remote doctor will decide on renewing a prescription for glasses or contacts. These types of sight tests have risen in popularity due to the low price and the comfort of staying at your home. The tests are done using a web camera and digital screen, along with self-reported information, and the results get sent to you via email. Online eye exams are mainly prescription renewal services that replicate an old prescription with little to no modification and do not access eye health. They lack essential evaluations and interpretation of intraocular pressure, eye muscle teaming, and external and internal eye health assessment. Unlike an in-person eye examination, online testing does not diagnose conditions including keratoconus, macular degeneration, glaucoma, and cataracts. Visiting an in-person eye exam takes a comprehensive, in-depth look at your eyes. Your optometrist will use advanced eye tools to carry out your exam thoroughly. In cases of eye disease, your optometrist will treat and manage the condition or refer you to the proper specialist. Online sight testing only measures eye chart vision and uses simple methods to estimate changes in eye focusing. 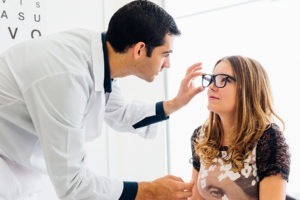 When you visit your eye doctor, you have not only the assurance of an up-to-date eyeglass and contact lens prescription but also the peace of mind of undergoing a careful assessment of eye health by a professional that has undergone at least four years of doctorate-level training specific to the eye. Online eye exams do not have these types of luxuries, which is why online sight testing companies display waivers about how their services do not replace an in-person eye health evaluation. When it comes to your eye health, you are probably best not to cut corners. Although online eye exams may seem like a good idea, they are inferior in quality and care provided by a professional in-person exam by a licensed optometrist. If you need to schedule your next eye appointment, contact ReVision Optometry. Located in San Diego, our office uses state-of-the-art automated instruments to ensure that you receive the proper care during your visit.